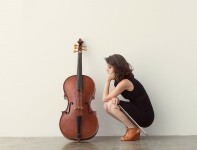 Fascinated both by the cello’s origins and the creative process of new music, Fulbright Scholar Elinor Frey performs with an honest and reflective beauty. Trained at McGill, Mannes, and Juilliard, she brilliantly layers sound and tempo with impressive technicality, and her Music on Main programme connects music across the ages. J.S Bach’s Cello Suites are cathedrals of sound, inspiring music lovers around the world. Along with the beloved C Minor Suite and the gorgeous Partita in D Minor, Elinor also brings to the stage new works for baroque cello commissioned from three remarkable composers; Ricercar by Linda Catlin Smith, Minerva by Lisa Streich, and Chimera by Ken Ueno. This concert is a manifestation of the captivating beauty of solo cello interpreted by a stunning musician.